What foods do I avoid on the gluten–free diet? Following a gluten–free diet means you should remove all foods that have gluten from your diet. 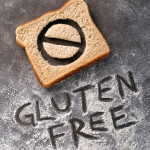 Foods that contain gluten should never be eaten by anyone with celiac disease. Remove grains that contain gluten from your diet.You shouldn’t eat any food that contains wheat, barley, or rye. Keep in mind that wheat has many forms. Avoid products that include bulgur, durum, graham, kamut, spelt, and semolina. These are all forms of wheat! Avoid all gluten-containing foodssuch as bagels, breads, cakes, candy, cereals, crackers, cookies, dressing, flour tortillas, gravy, ice cream cones, licorice, malts, rolls, pretzels, pasta, pizza, pancakes, sauces, stuffing, soy sauce, veggie burgers, vegetarian bacon/vegetarian chicken patties (many vegetarian meat substitute products contain gluten) and waffles. Please note this is NOT a complete list. Fortunately, gluten-free varieties are available for most of these foods. Look for “hidden” sources of gluten.Avoid foods that list gluten-containing ingredients such as ale, barley, beer, bleached flour, bran, bread flour, brewer’s yeast, brown flour, brown rice syrup (unless the food is labeled gluten free), bulgur, couscous, dextrin (unless the source is gluten-free), durum, farina, farro, hydrolyzed vegetable (wheat) protein, gluten flour, graham flour, granary flour, groats, harina, kamut, malt, malt extract, malt syrup, malt vinegar, matzo, modified starch (unless the source is gluten-free), rye, orzo, seitan, semolina, self-rising flour, spelt, smoke flavoring, soy sauce, triticale, wheat germ, wheat and white flour, whole meal flour, and vegetable gum. What’s important to know about barley? Barley contains gluten and is frequently used to make malt. As a general rule you should avoid natural or malt flavorings. If a food has “natural” or “malt” flavorings listed on the ingredient list, contact the company to see if these flavorings came from a non–gluten source. Do I need to avoid oats? Oats may contain gluten because they’re often processed in the same factories as wheat. It’s best to check with your health care provider to see if you can eat traditional oats or if you need to look for certified gluten-free oats. To find out if your favorite brand of oatmeal is gluten-free, check the package each time you purchase them. You can also call the company or check the brand’s website. Some brands, such as Bob’s Redmill, Glutenfreeda, and GF Harvest make oatmeal that is certified gluten-free. When eating out or when in doubt, avoid oats and oat-containing cereals and breads. What foods are safe to enjoy on the gluten–free diet? There are lots of delicious foods to enjoy! Many foods are naturally gluten-free, including milk, butter, cheese, fruits and vegetables, fresh meats, fish, poultry, eggs, beans, nuts, seeds, corn, quinoa, and rice. While most breads, pastas, cereals, and baked goods are made with grains and flours containing gluten, there are many grains and flours that are naturally gluten-free – and many products on the market made from these grains and flours. Think of these grains, and products made with them, as safe foods – in other words, safe to eat on the gluten-free diet! How can I tell if a food is gluten–free? 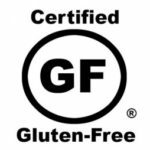 A product labeled “gluten-free,” “no gluten,” or “without gluten” is the fastest and easiest way to spot a gluten–free product. Manufactures can add this label if they comply with the FDA rule of “gluten–free”. Another way to tell if a product contains gluten is to read the allergen statement on packaged foods. The FDA food allergen labeling law requires food companies to label all foods that have wheat or contain wheat products. The allergen statement is found at the end of the ingredient list on packaged foods; if it says “contains wheat”, this means it has gluten and it’s unsafe. The food labeling law does NOT apply to barley, rye, or oats. This means if the allergen statement does not include wheat, you need to continue reading through the ingredient list for the other sources of gluten described above. If you don’t see any of those words in the ingredient list, then the food is most likely a safe food. In the sample ingredient label below, the ingredients are circled in red and the allergen statement is circled in blue. This food, which contains whole grain wheat, is not safe . There is also a symbol that may appear on packaging of gluten-free foods, which the Gluten Intolerance Group has deemed “Certified Gluten Free.” This symbol represents that the food manufacturer has applied for and been granted certification of the product’s status of gluten-free, by submitting test results showing that there is no gluten contained in the product.